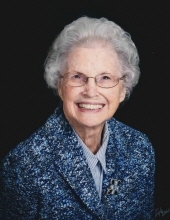 Mary Ruth Peebles (née Hedley), 92, passed away peacefully on November 27, 2018, at Forsyth Nursing and Rehab, in Forsyth, Missouri. Ruth was born in Dillard, Missouri, on March 3, 1926, to Harry Hedley Sr. and Lucie Lorine Carl Hedley. She attended Mountain Grove Schools, graduating in the class of 1943 - a devoted leader of her alumni organization and passionately dedicated to the violin. While her high-school sweetheart, James Keith Peebles, was serving the US Navy in WWII, Ruth attended Southwest Missouri State college in Springfield. It was during this time that she was saved and baptized at the South Street Christian Church. When JK returned from service, the two were wed February 18, 1947, and enjoyed 60 wonderful years of marriage. The couple began married life in Mountain Grove, renting a $10-per-month farm property - complete with outhouse, no running water, and no electricity, but were soon blessed with two daughters, Carol Keith Peebles Ellis, born June 3, 1952, and Marilyn Louise Peebles Lawson, born August 17, 1956. The family were devoted members of the First Christian Church of Mountain Grove. Ruth dedicated over 40-years working at Home, Building, & Loan in Mountain Grove. After retiring in 1988, she and JK relocated to Pontiac, Missouri, where she kept active as secretary of the Ladies’ Social Club, and member of several string ensembles including the Con Brio Trio, Barjoch String Quartet, and Mozark Community Orchestra. The couple faithfully attended Memorial Christian Church of Mountain Home. She was preceded in death by her husband, James Keith Peebles, her parents, two brothers and sisters-in-law: Harry Hedley Jr. (Peggy) of Prosser, Washington; and Leo Carl Hedley (Olive) of Shalimar, Florida; and daughter Carol Ellis of Pontiac, Missouri. She is survived by her daughter Marilyn Lawson (Kerry) of Saddlebrooke, Missouri; four grandsons, Aaron Ellis of Rolla, Missouri, Jonathan Lawson (Cassandra) of Nashville, Tennessee, Jordan Lawson of Nashville, Tennessee and Lincoln Pommert of Joplin, Missouri; one granddaughter, Maranda Arnold (Trevor) of Maitland, Florida; three great-grandchildren - Zane Rimes, Caroline Arnold, and Joseph Arnold of Maitland, Florida; as well as son-in-law Charles Ellis of Pontiac, Missouri. Her many nieces, nephews, and cousins will remember her fondly. In lieu of flowers, those who desire may make a donation in Mary Ruth’s memory to St. Jude Children’s Hospital in honor of her great-grandson Zane. To send flowers or a remembrance gift to the family of Mary Ruth Peebles, please visit our Tribute Store. The family has requested in lieu of flowers that memorial contributions be made to St. Jude Children's Research Hospital in honor of her great-grandson, Zane Rines. "Email Address" would like to share the life celebration of Mary Ruth Peebles. Click on the "link" to go to share a favorite memory or leave a condolence message for the family.